Yes! Eric would have a worthwhile book. I’d buy it, Eric. Added to my wish list. Get the cover image up on Amazon! Thanks, Mike. I appreciate you helping to publicize, and explain what I’ve been doing lately. And I agree with TS that “The Everything Cocktail Cookbook” would be fantastic delicious! Just basking in your reflected glory, oh ISBN’d one. And being a cast iron dropout (I ditched my pan when we last moved) I look forward to buying a new one and learning the right way of going about it. Though I didn’t see any mention of nachos. Can you make nachos in cast iron? I think you can make anything in cast iron. I use it for everything except warming up a can of soup and boiling water for pasta. So whether you’re the type to sprinkle cheese and toppings over chips and baking them in the oven, or they type to make a cheesy dip, that can all be done in cast iron. You had me at pan fried crab cakes (I grew up on the Chesapeake Bay). Congrats Cinnamon! 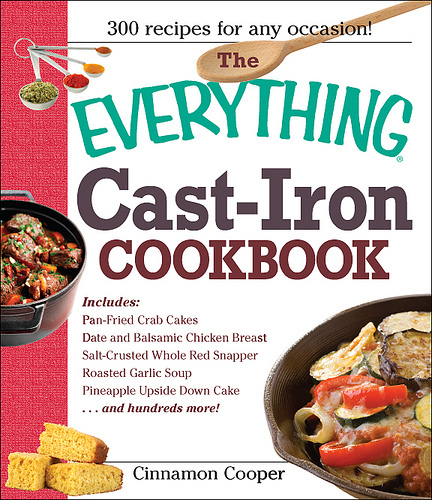 I only use cast iron for steaks, but I’m looking forward to learning 300 new uses for it! And there’s already an Everything cocktail book or two, and a whole series of For Dummies titles, and on and on. But that’s not going to stop me from doing more research . . .